Many Laindon people will remember my mother Savitri Chowdhary as the wife of my father, their well loved G.P. She was indeed a most supportive loving spouse and mother and her determination to succeed in whatever task she set herself knew no bounds. Her inspiration may have come from the character she was named after in Hindu mythology as Princess Savitri’s steadfast loyalty to her husband so impressed Yama, the God of Death that he granted her wish and released her husband from Death allowing him to return to life to resume his role as her husband. My mother was born in Multan, now in Pakistan. She had four sisters and a brother and was particularly devoted to her father, a school teacher, following him into that profession teaching in a girls school before marrying my father and moving to live with his family in Muradpur a small village in Punjab India. Soon after their marriage my father came to England to study for postgraduate medical qualifications. He decided to stay, taking up a post of G.P. in Laindon. After a four-year separation, my mother joined him in 1932. After the long sea voyage, she finally reached Victoria Station in London, fully expecting her husband to be there to meet her but was disappointed not to see him and after waiting in vain took refuge in the home of a fellow passenger. When he eventually arrived there his reason for the delay was that he had been held up with a patient, gently explaining that they had to get back to Laindon straight away in time for evening surgery. Such was his devotion to duty! 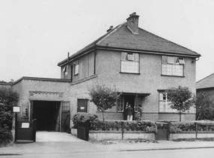 Their first home was at York Villa, in the High Road where facilities were Spartan with no electricity and outdoor bucket W.C. There was a resident maid but it was understood that once my mother found her feet the maid would be leaving – in fact my father had found her work elsewhere. When Dr Gilder, the Senior Partner retired, my father purchased the practice and my parents moved to Daisybank where the surgery was conveniently situated at the side of the house. Whilst she struggled at times to grasp her totally new way of life as a doctor’s wife in a small English town, her determination to adapt and prove her worth shone through. Part of this adaptation was to give up being a strict vegetarian and to start eating fish, eggs and meat. She also had her waist length hair bobbed and started to wear western clothes, saving her silk saris for evenings out and formal functions. She learnt to cook in an English way, keeping curries for evening meals only. Although she spoke reasonably good English, my mother took lessons to increase her vocabulary and knowledge of colloquial language with Miss Helen Perry, a retired schoolteacher who lived with her sister at a house called St. Benets in Noak Hill Road. My mother’s religious upbringing gave her a strong belief in God and this underpinned her efforts to adapt herself to the new environment, giving her strength of purpose and an optimistic outlook. In the event, she succeeded in providing a supportive situation at home and soon established herself with local people as a helpful, kind person with a strong interest in other people’s lives and experiences. My brother in his tribute to her described her “like a ray of sunshine as she darted about helping people and working hard to keep the practice going”. By the time my brother was born in 1935, my parents could afford help in the home and my father took on an assistant as well. Before the outbreak of war my mother was lured into the campaign for Indian independence and became a member of the India league. The guiding light of this organisation being Krishna Menon, a one time St Pancreas Borough Councillor, co-founder of Penguin books. 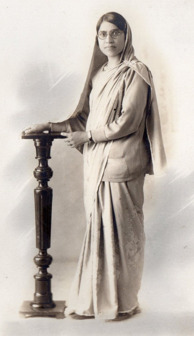 She attended meetings in London and was sometimes asked to speak in public, an experience which, stood her in good stead in later years when she lectured to various societies on Indian festivals and culture. Following a difficult pregnancy when she fell over during the seventh month fracturing her pelvis, my mother gave birth to me in 1938. By then she was quite used to taking second place to my father’s heavy workload, not minding when he did not come to visit her in Southend General Hospital each evening after the birth like other fathers. During the war years my mother spent most of her time in the heart of the local community, in particular, supporting those whose relatives had been killed, wounded or reported missing. At some stage, when the authorities ordered evacuation of the Southend area, many Laindon people, especially mothers with young children, decided to go away to safer places for a while and she took my brother and myself to St Austell in Cornwall where we stayed with the Kelynack family who had earlier had a chemists shop in Laindon High Road. We returned to Laindon after a few months when air raids were beginning to take place in Cornwall as well and spent the rest of the war at Daisybank with my father. When Mount Everest was being scaled for the first time in the early 1950s, a letter in the Times newspaper drew her attention to the fact that Raymond Lambert, a mountaineer with Sherpa Tensing, who reached the then highest point of the mountain, always ate a large bowl of semolina pudding whilst on expeditions and considered that because of this, nothing ever went wrong. This prompted my mother who had by now qualified as a journalist, to respond pointing out that Indian people also enjoyed semolina preparations, in particular Halva. She gave the outline for the recipe. Her letter went on to say, “This dish is one of the oldest and most popular sweet dishes of India. Elderly ladies firmly believe that this is the best food for giving strength and energy. It is also the favourite sweet dish of the Punjabi Sikhs, who are universally known for their fighting ability, strength and tenacity”. In response my mother received letters from all over the world asking for the full recipe for Halva as well as expressing interest in other Indian dishes. This prompted her to embark on writing a recipe book, which as Indian Cooking published by Andre Deutsch in 1954, held the field as the only one of its kind for many years, until the admirable Madhur Jaffrey and others picked up the torch. Research for the book included visits to India to refresh her existing knowledge as well as to discover new dishes. Although the recipes in Indian Cooking favour the cooking used in Punjab, they are essentially classic in their method and easy to follow with the ingredients readily available. 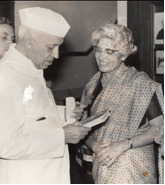 She can be seen in the photograph presenting a copy of the book to Prime Minister Nehru on one of her many trips to India. The book was re-published after she died as part of a cookery classic series in 1999. She would have been delighted to know of the renewed interest in her book and that her recipes continue to contribute to the richness of the different cuisines that we now enjoy. Despite my mother’s many other activities, she never lost the traditional Indian value that sees food preparation as an expression of love and nurturing of the family. In enjoying the delicious recipes, you not only continue to be nourished by her, but are also enriched by an essential quality that was an integral part of her. As I said in the article about my father, the high point of his day after a hard time tending to his patients, was the Indian meal prepared by my mother which he loved. He enjoyed spicy food and as children, my brother and I would watch the perspiration appear on his forehead and trickle down his face as he ate with relish, frequently augmenting his main meal with home made hot pickle and raw chillies. As children my mother made mild curries for us. Even our dog enjoyed left-over curry and was particularly fond of chapattis! Whenever I was feeling below-par, my mother would cook something tasty usually pakorhas as they gave warm savoury comfort and had a magical effect, raising the spirits of the most unhappy child. If you had a sweet tooth, then carrot halva would have a similarly uplifting effect. 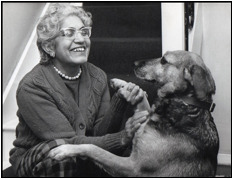 As well as Savitri Chowdhary being the author of Indian Cooking, using material from her detailed daily diary entries, she wrote a memoir called “I made my Home in England”. This describes in some detail her experiences as a young Indian woman adapting to a totally new way of life as the wife of a dedicated doctor in the small community of Laindon. This is soon to appear on the website and so I will not elaborate on the contents at this stage. She also wrote a short piece about my father’s death – “In Memory of my Beloved Husband”. Prior to my father’s sudden death in 1959, Basildon Development Corporation had revealed plans to demolish most of Laindon High Road – this of course included Daisybank. I recall how my father attended meetings and expressed strong opposition to the plans. He told us that he would never leave our home and would remain there even when the bulldozers came. In the event, he died before the house and surgery were demolished, so my mother, my brother and myself had, not only to suffer this most devastating loss, but also the subsequent loss of our family home a couple of years later. In those days there was no law requiring Basildon Development Corporation to pay market value for property and land obtained by compulsory purchase order and so the payment made to my mother in no way reflected the true value of the four bedroom house and large amount of land at the back. Not wanting to move out of the area, my mother and brother moved to a smaller house in Clayhill Road, Basildon (by then I was living away ). My mother had a rare capacity to accept people without question and I never heard her make a critical or negative observation about anybody. Being a gregarious person, she made many new friends of all ages in Basildon and soon became a familiar figure walking her dog in the area. She was able to keep in contact with her many Laindon friends as well, remaining a governor at Laindon High Road School, retaining a close link with Chowdhary School and continuing her work for the elderly. She carried on regularly writing interesting letters to both the National and local press, copies of many of these are still in my possession and will be the subject of another article. They were usually upbeat reflecting her optimistic view of life. Writing was always an important part of her life and as well as her daily detailed diaries, she wrote several articles and started a novel. Always in touch with the spiritual dimension, as well as retaining a link with my father after his death by meditating in front of a photograph of him, my mother also began meditating whilst watching the sun(through dark glasses). This became a daily occurrence whenever the sun was out of course and, to quote my brother again “ she missed it when it went in, yet never despairing of its reappearance.” She seemed to gain emotional strength and wellbeing from this habit. In 1983, over twenty years after my father’s death, she decided to sell her house and moved to live in Chelsea with my brother and his wife who had prepared a flatlet for her on the ground floor of their house. The move involved severe downsizing and my brother and I who were overseeing the move in Basildon never understood how all her remaining possessions were fitted into the small area by my sister-in-law and my husband at the other end. Although she missed all her Laindon friends, my mother found it comforting to be in a loving environment after living on her own and valued all the care given to her by my brother and sister-in-law with visits to my husband and myself at Bromley on Sundays. Shortly after the move, the ailments she suffered from made it harder and harder for her to walk unaided. 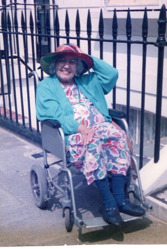 After a period of adjustment to her new home, she became a well known figure in a wheelchair, being acknowledged by local residents as well as Chelsea Pensioners in the Kings Road. In a letter of condolence a friend wrote of my mother “Most people wear a wheelchair as an encumbrance and a disability, but she sat in it like a queen!” Despite her ill health she managed to enjoy life and remained optimistic and jovial, giving pleasure to those around her. One of her great loves was music and she had a good singing voice – I have a strong recollection of singing Indian songs and hymns as well as English pop songs with her whenever we met, one of her great favourites from the old days being “You are my sunshine”. Savitri Devi Chowdhary died in the Chelsea and Westminster Hospital in January 1996 aged 87 from a bout of pneumonia. In a letter of condolence the late Mavis Folkard (nee Gray) wrote “She had a great capacity for making friends and always remembered people. We had a lot of laughs whenever we met…I shall always remember her with affection as will many local people”. My mother remained a Hindu till she died and both Hindu and Christian priests contributed to her funeral service reflecting the high regard in which she held these religions. My brother in his tribute to her quoted aptly from Shakespeare emphasizing her acceptance and kindness towards everyone she came into contact with “a largesse universal like the sun her liberal gaze did give to everyone”. He went on to say “The emphasis on the sun if not accidental as the sun held a special place in her affections”. Although she is greatly missed, my mother’s radiance still shines brightly for those of us who remember her. Shakun, I have only just discovered this website after attending my uncle William Diment’s funeral on October 8th. You mentioned my aunt Kathleen Clegg in correspondence with uncle Bill. Kathleen married Brian Pateyjohns and they emigrated to Australia back in the late fifties or early sixties. We have visited Kathleen and Brian a couple of times, they ran a stud farm in the Barossa Valley, South Australia and are now both retired. You also spoke of my uncle Donald Clegg. As children we knew that our lovely uncle Don had been injured in the war and I seem to remember my mother, Violet Clegg (nee Diment) saying he’d been treated at Roehampton Hospital where reconstructive surgery was pioneered. As kids we were never told much but I did see a short account which Donald wrote for one of his regimental reunions, telling of what happened to him. Sadly this was after he’d passed away. Robert, your aunt Kathleen was in my class at Langdon Hills School. She sat in front of me. I forget the crime but on one occasion I had four of the best administered on the back of bare legs with a wooden ruler by Mr Taylor. In front of the entire class. On the way back to my seat with tears from pain, humiliation, or both, Kathleen Clegg muttered to me “boys don’t cry.” To this day I do not know if it was meant to comfort or criticize. When you are next in contact with her please give her my regards. Maybe she will remember me. Or maybe not. I was thinking about Dr Chowdhary the other day and one thought led to another then a third and so on, as is often the case. My memory of Dr Chowdhary’s surgery is one room with wooden benches along three walls. These were usually pretty full. There was no take-a-number system or receptionist to take names or paperwork to fill out. After the previous patient had exited, and after a moment’s delay, there was a loud “next” and the next in line went in. Who was next? It seemed that each person kept track of those who were there before him (or her) and also kept track of those who came in later. As there was usually more than twenty people at all times this must have taken quite some mental effort. It might seem very confusing to the modern ear but it worked. I never saw any argument about the next in line. It seemed there was no supporting staff. No receptionist. No nurse. No assistant. Memory says that Dr Chowdhary was a one man band! You went in to see him when it was your turn to answer the “next”, was seen and examined, left with appropriate instructions to follow and that was that. Of course this was all prior to the National Health Act. How did patients pay for Dr Chowdhary’s services? Did Dr Chowdhary keep a little book, updated after each patient, to reflect billings? How were patients billed? By mail? I can remember no set up for immediate payment there and then. Very few people had bank accounts, credit cards were unknown. It was a cash society. One cannot send cash through the mail so how, where, and when were bills paid? Was it a matter of the next time down the High Road popping an envelope with cash and the invoice through his letter box? There had to be a set of books to run the business and reflect different transactions and bills outstanding. Or was there? Who maintained all this and kept up with it? Certainly not Dr Chowdhary. He was far too busy I am sure. Or perhaps my memory is simply deficient which is more likely the case. William, indeed there was only one bungalow between Daisybank and Butlers and there were many jokes about the doctor being so close to the undertaker! I remember a family called Lowe living in the bungalow and David Lowe being friendly with my brother. Kathleen Clegg and I were friends for some time and I clearly remember the awful accident which befell Donald Clegg when he was badly scalded all over and was brought to the surgery in a terrible state. My father’s skill was crucial at this point. Once again my thanks to everyone for sharing their memories of my lovely Mummy. Thank you Shakun for confirming my memory regarding the house locations. Also regarding the terrible accident which occurred to Donald Clegg, it reminds me that Donald suffered another similar happening in later life. Donald, like myself, served with the Royal Tank Regiment and after D Day his tank was hit and caught fire which is one of the hazards the crews face. The flesh of his hand was completely burned away leaving just the bone. He was invalided out and faced many operations to restore some the use, but never completely restored it. Another small point, did the David Lowe she remembers join the police and marry Doreen Mansfield, a Laindon Park schoolteacher a marriage which sadly did not last? Doreen was quite well known but in her later years suffered ill health and the last I heard that she had entered a nursing home in the midlands. Sorry William but I just do not know what happened to David Lowe in later life, I think the family moved when David was still a young boy of about ten. He used to come through the hedge separating our two gardens to play with us. I do have a photo of him somewhere and will try to locate it. Dear Shakun A lovely tribute to your Mother, it brought back memories of years ago. I am sure everyone who remembers your parents will find it enjoyable to read. Thank you Nina for clarifying this point in respect of the High Rd., buildings. I was not absolutely sure there were not three dwellings between Daisybank and A.G.Butlers but I felt it was wrong as in the spring of 1940 I got a 24hr pass to attend the wedding of my eldest sister Violet to Stanley Clegg with the reception taking place at A.G.Butler’s where the Clegg family lived and remembered it as being very adjacent to Daisybank. Also Ann Rugg has cleared up another mistake of mine in respect of Mrs.Chowdhary and the swimming by pointing out that it was the widow of Dr.Long who helped swimmers at the Club Kingswood where I was once a member. It is probably the respective professions of their husbands which caused the confusions in my memory. Another small point on interest which comes to mind, but unconnected to the foregoing, was that the Club Kingswoood regarded itself as a superior class of club and that a world famous jazz musician, Kenny Ball had his membership terminated as his mode of dress on the squash courts did not meet the club’s standards. Perhaps Shakun can resolve a problem that has taxed my memory in respect of the Laindon High Rd. as described in the Basildon History website. It shows that there were three private dwellings between Daisybank and A.G.Butler’s, yet try as I might, I cannot remember these. Thanks to Shakun for such an interesting article on her lovely Mother Mrs Chowdhary. I also remember her being so helpful and friendly, especially when Mrs Cann and Mrs Baylis were working through The Community Hall to provide food and activities for the elderly in the area. My mother-in-law, Mrs Jessie Rugg worked for many years with Miss Janet Duke at Markhams Chase school and she too used to admire Dr and Mrs Chowdhary’s efforts within the local community and they were always busy and helpful. One small point though I cannot remember Mrs Chowdhary being involved with swimming but I do remember Amy Long (Dr Longs) wife/widow being a very keen swimmer and she was a member at Kingswood in its early days. She also swam miles at Gloucester Park pool well into her senior years. With fond memories of the lovely folk I have mentioned. William. This may be helpful. We have a copy of the 1949 Survey which shows the order of plots going from Ulster Road to Essex Road as follows: Elinor, Glenrosa, Avondale, Streatham, Orizaba, Daisy Bank, Jireh, A G Butler, Maple Lodge, vacant plot, vacant plot, Careys. So it would seem there was just one plot between Daisy Bank and A G Butler, but three plots between A G Butler and Careys. It was lovely to read about Mrs Chowdhary. She was a school governor at the same time as my mother, Mrs L F Norman and they had much in common. I last saw her at our wedding in 1972 and still have the tablecloth she gave us. We lost contact when we moved to Hastings, but I was delighted to be able to buy her recipe book! I am very touched by the interest and comments about my mother, it was indeed a joy to write about her and her many achievements. Thanks so much. Eric – I was at Markhams Chase from 1943 – 1945 and was subsequently went to a boarding school in Gloucestershire recommended to my father by Janet Duke. I don’t remember your sister Ruth – does she have any recollection of me? Apparently I was very naughty and somewhat rebellious! Mr Diment I very much value your interesting articles and comments on the website, your shared memories are such an important part of our history and will now be preserved. I do not know whether or not my mother was involved in the club Kingswood – she never mentioned it to me but she was certainly always ready to help others. Dear Shakun, I have so enjoyed reading about your Mother – it so complements the article on your Father. What a truly wonderful family and how lucky were Laindoners to have been blessed with you all. I have just given my daughter a copy of your Mother’s recipe book and she is very pleased with it. I too spoke with you at the Manor Mission and hope we will meet up again sometime. A wonderful piece Shakun and although I did not know your mother I now feel that I do. Your father was my doctor until his passing and I know how everyone in Laindon admired him and no doubt your mother too. A wonderful insight to a remarkable lady. You may have gone to Markhams Chase with my sister Ruth. Further to Shakum Banfileld’s letter. While I knew her father well as being one of his patients for nearly three decades. I am almost certain that I knew her mother in later years from the Club Kingswood where she was always ready to help people improve their swimming, although as she makes no mention of this, perhaps it is my mind playing tricks. Shakun. It was lovely to meet you at The Manor Mission in April. I had been looking forward to your article and enjoyed reading it as soon as it appeared on the website this morning. I had previously read the book your mother had written about her life, but your article says even more about her very varied interests and talents. At Markhams Chase school in the early fifties, we were often served with semolina milk pudding accompanied with a shortbread biscuit. I now wonder if this was on your mother’s recommendation because of its nutritional properties. I’m sure many children benefitted from such ‘strength and energy’ foods in the post war years. Curry and other Indian foods were not on the menu here then, yet today, Tikka Masala is said to be our country’s favourite dish and many children refuse to eat milk puddings. How times have changed. Your mother’s adaptability was amazing. 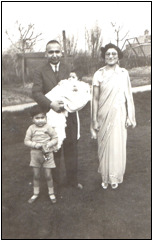 Without ever forgetting her Indian roots, she became a true Laindoner like so many of us, from her first home with its inadequate amenities, right through to the compulsory purchase with poor compensation. The photographs showing her wonderful sunny smile are simply lovely.